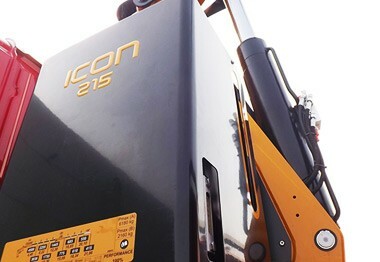 ICON is Effer’s new construction philosophy that revolutionizes the traditional concept of cranes. 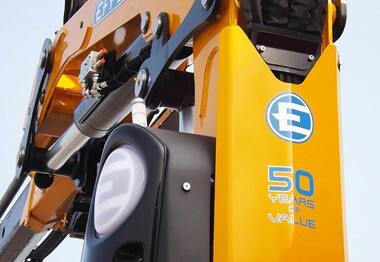 Beauty in design is important: the Italian Effer design is reflected in the aesthetical detail in every ICON crane, making the machines both beautiful to look at as well as having very high operating performance. We have renewed the lines of these cranes, from the column to the jib, to the control panel of Progress 2.0. Even the new housings in high-tech materials stand out with their sophisticated design that enhances the crane structure look. Also this time we have thought of everything. Our new ICON cranes are not only beautiful, but they have many solutions to facilitate your work and routine maintenance. For example, the distributor housing has a handy zipper for inspection and maintenance, and all the information required by regulations are clearly laid out on the display, including the on the one that covers the tank. We have also added the exclusive non-slip mat for added safety when you have to do operations near the column, or the large backlit level enabling you to work safely and comfortably. Effer R&D division has poured all its experience and creativity into ICON cranes. The result of this study is a range of machinery with exceptional technical features, such as the electronic management system Progress 2.0 with panel optimized for maximum ease of reading, the automatic swing-up device for stabilizers, the automatic management of fan speed, the new lattice guidance system and many other solutions. ICON also means aesthetic and attention to detail, and this reflects in the slender and sporty lines of the new 215, the first specimen. Other than its operative performance it is also a beautiful machine to look at and to possess. A design expressing power, agility and operative immediacy. 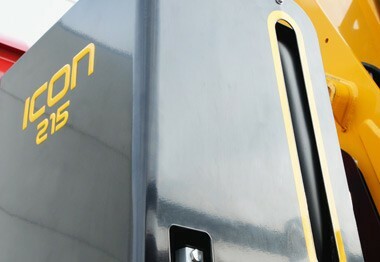 Information on performance is easy to consult thanks to the new large-dimensioned stickers put on the metal housing in a smart position for the operator. Greater visibility to work more safely. The whole panel of the new electronic control system PROGRESS 2.0 is always lit up for maximum visibility under all working conditions (nocturnal work, low light) and for maximum ease of use. Moreover there is a new column for visual alerts. 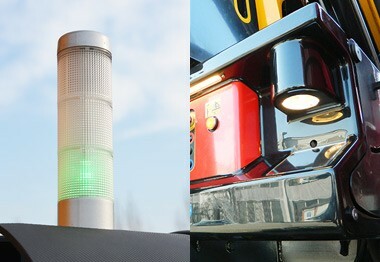 Now the spirit level is enlightened with a LED visible also under bad weather conditions, and thanks to a play of mirrors it can be seen also frontally for maximum ease and rapidity during truck positioning. 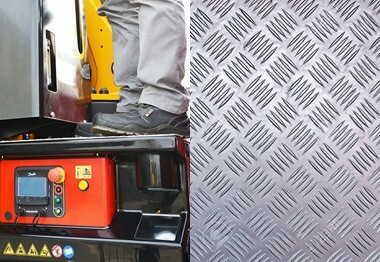 On ICON cranes there is a walk-on flooring which is rigid and resistant, made in antislip aluminium plate, also protecting the elements below. The column side housing is very easy to open to quickly access the distributor without needing to demounting anything nor use tools. 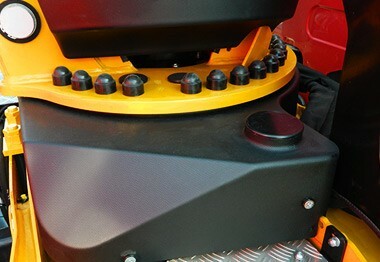 In case of need, the operator can directly access the heart of the crane, for example in case of emergency. The housing, in metal, covers the tank and protects connectors, pipes and components.  It's resistant, easy to clean and with minimalist, aesthetically pleasing design. This conception allows us to apply stickers on the housing with all information that the operator needs for an intuitive consultation. Also the oil cooler has a metal housing for maximum protection and durability over time. The slewing ring is in a protected position thanks to its housing in resistant hi-tech material: a detail which also prevents direct contact with the gears.